A Peace Prize for Obama? 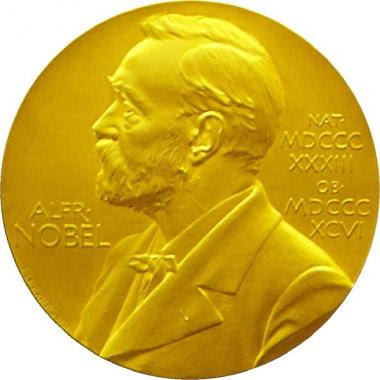 It seems that everyone is baffled by the decision to give President Obama the Nobel Peace Prize. Even the sycophants in the media have been unable to hide their surprise. A few people have suggested that this is meant as a slap at George W. Bush. This seems to me to be the most plausible explanation. Certainly, Bush was never popular in Europe. His sneering comments about “Old Europe” and his proposal to put a “missile shield” (that nobody wanted or needed) in Poland didn’t win him any friends. The hapless Gerhard Schroeder’s approval ratings skyrocketed when he merely thumbed his nose at Bush. Perhaps if Dubya had been nicer to our friends across the pond, they might have given him the Peace Prize. After all, they’re not too picky about whom they give these things to. I heard a TV reporter ask someone if the Peace Prize had been “degraded” by giving it to Obama so early in his administration. Actually, it was degraded a long time ago. In 1906, they gave the Prize to the arch-imperialist, Theodore Roosevelt, who presided over the bloody suppression of the Philippines. (The Nobel Prize for Literature has been similarly degraded. In 1953, they gave the prize to Winston Churchill for his ghost-written history of the Second World War.) In fact, giving the award to Obama actually elevates it somewhat, since he hasn’t killed nearly as many people as Nobel Laureate Henry Kissinger did. Please, don’t get me wrong: I don’t doubt for a moment that the people in the Nobel Peace Laureate Project are completely sincere and well-intentioned. My point here is that it’s not enough to say that one is in favor of peace. (I don’t doubt for a moment that even Gen. McChrystal believes that peace is a worthy thing.) The problem is that nations go to war for specific reasons, not because they believe that war is an end-in-itself. The abstract notion of “peace” can mean different things to different people. This is why the Nobel Peace Prize is meaningless. This entry was posted on October 10, 2009 at 8:03 am and is filed under Eugene, Imperialism, Obama. You can follow any responses to this entry through the RSS 2.0 feed. You can leave a response, or trackback from your own site.